CITY HALL—Today, New York City became the nation’s first municipality to ban the use or discharge of natural gas and oil waste products, including from hydraulic fracturing. Intro 446-A protects New York City communities from toxic pollutants and safeguards our water. The waste associated with hydraulic fracturing (“hydro-fracking”) and other natural gas and oil extraction processes frequently contains naturally-occurring radioactive elements such as radium, carcinogens such as benzene, and other chemical additives. Without adequate protections in place, these pollutants could leach into our local ecosystem and drinking water. Although the State of New York banned high-volume hydraulic fracturing in 2015, the briny byproduct is vastly under-regulated at the state level and has been used to remove ice and control dust on roadways, but used in this way, or disposed of in wastewater treatment facilities or landfills, the pollutants could run off onto adjoining land and contaminate our rivers, streams, and aquifers. Ban the application of any oil or natural gas waste upon any road, real property or landfill located within the City. Require all City bids or contracts for the construction or maintenance of a City road to include a provision stating that no materials containing or manufactured from oil or natural gas waste shall be utilized in providing the service. "Intro. 446 will ensure that fracking and oil extraction waste byproducts will not be used or disposed in our city,” said Council Member Costa Constantinides, Chair of the Council's Environmental Protection Committee. “This type of hazardous substance does not belong in our landfills. 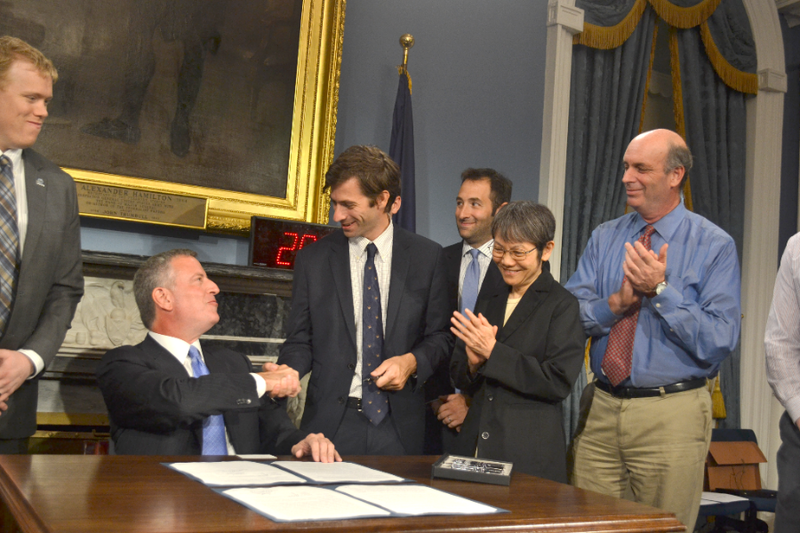 This legislation helps us keep our environment clean and maintain our public health. I thank Council Member Levin for his leadership on this important issue." "We are obligated to do whatever we can to protect our environment," said co-sponsor Council Member Daniel Dromm. "Our children deserve access to clean drinking water. When passed, this legislation will establish protections that will safeguard our city's water supply for many generations. 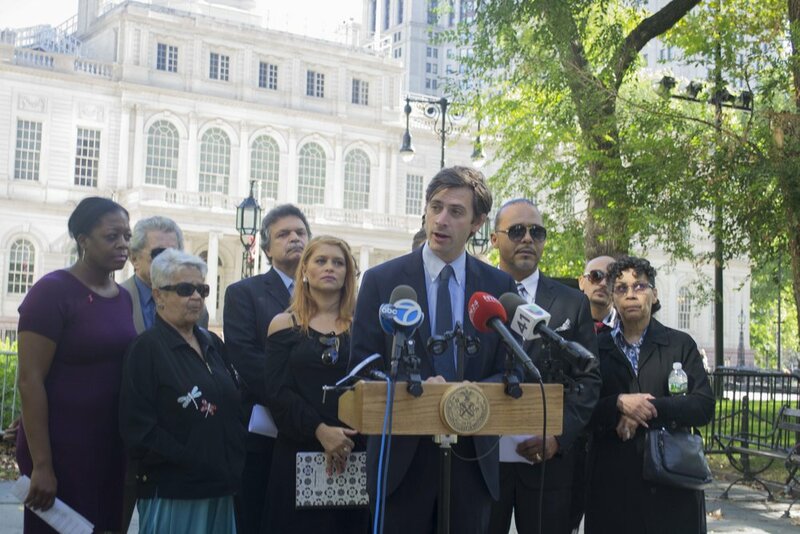 I am proud to work alongside Council Member Levin on this important issue and thank him for his leadership." 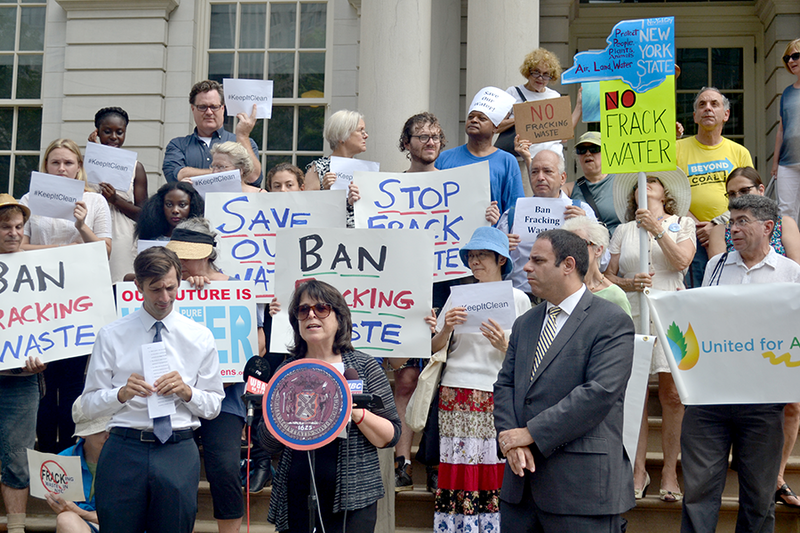 "Despite New York State's strong stance against fracking, its harmful byproducts can still end up in the city,” said Council Member Daniel R. Garodnick. “We need to close this loophole-- and that's why Intro 446-A is so critical. It will keep these dangerous materials from entering our environment and protect public health across the five boroughs." As the 2015 NY State Law did not ban wastewater use and disposal, 15 New York counties have taken similar steps to ban byproduct disposal. The threat is real: New York state continues to allow more than 12,000 low-volume fracking wells and road-spreading of briny wastewater is permitted in at least 15 New York counties. 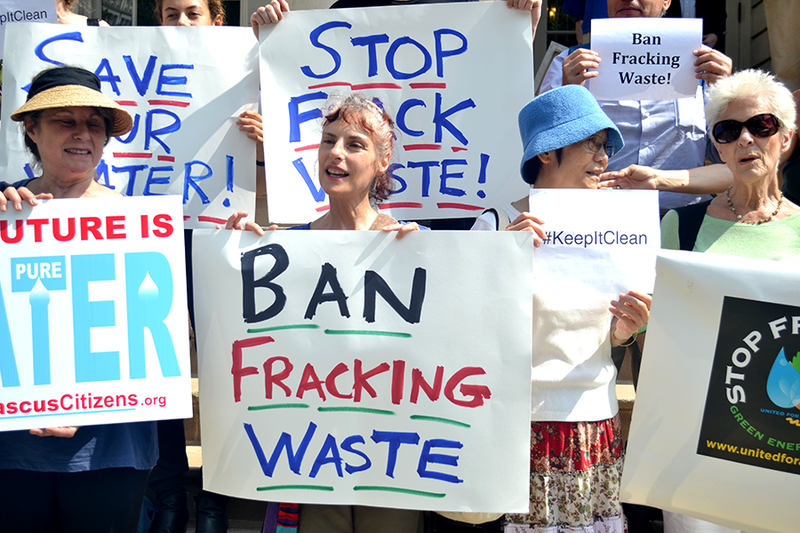 “Even though high volume horizontal hydraulic fracturing is banned in New York State, New Yorkers are not protected from the harmful effects of toxic and radioactive fracking waste. 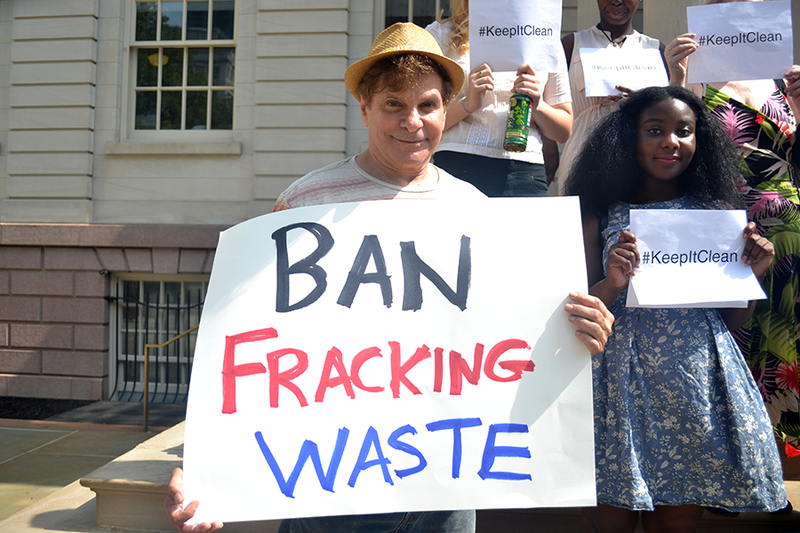 Since there are no federal and state laws regulating the disposal of fracking waste, we commend the New York City Council for the passage of Int 446-A and wish to thank Council Member Levin, Chairman Constantinides, and all the council members who sponsored this bill for protecting the people of New York City from being exposed to toxic waste that could contaminate our air and water," said Ling Tsou, Co-Founder of United for Action. In June, the U.S. Environmental Protection Agency (E.P.A.) has taken similar action to protect our waterways, creating a new rule to prevent disposal of wastewater from hydraulic fracturing at public sewage plants. Such facilities are not typically outfitted to extract high concentrations of the solids and pollutants found in oil and natural gas waste.The EPA cited that untreated, wastewater could negatively affect drinking water, aquatic life, and irrigation. 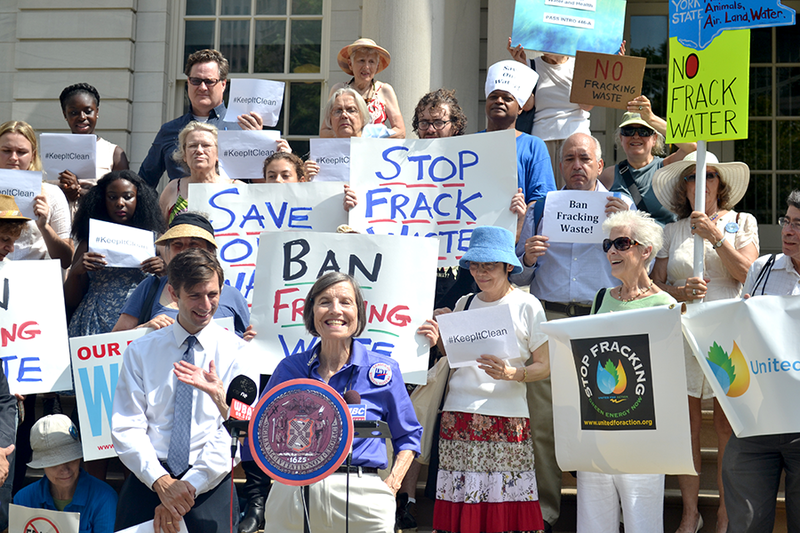 “Our statewide fracking ban, enacted in 2014, was a watershed moment for health and public safety in New York. But in terms of protecting residents from the numerous hazards associated with fossil fuel extraction, it wasn’t the end of the story. 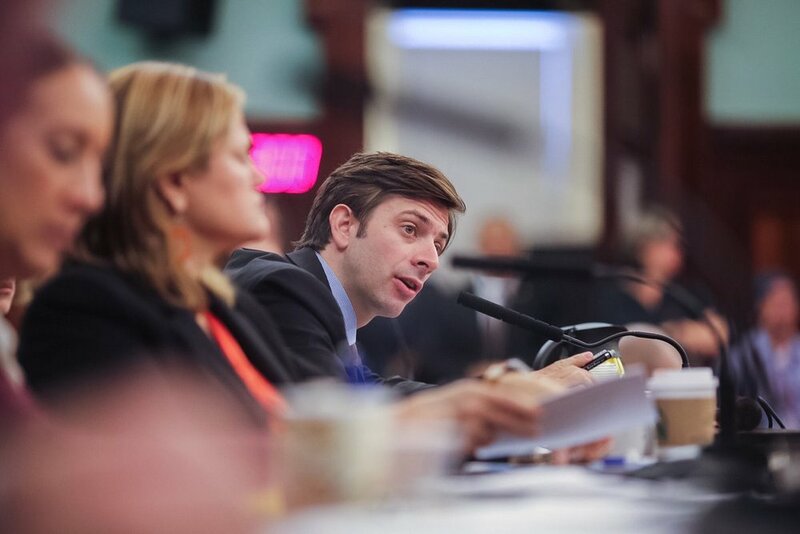 Councilman Levin knew this, and we’re grateful for his tireless work to ban all oil and gas drilling waste from our city,” said Alex Beauchamp, Northeast Region Director at Food & Water Watch. “With this law, New Yorkers can feel safer knowing they will forever be protected from the serious harms that toxic, radioactive oil and gas drilling waste pose to communities big and small." Intro 446-A now awaits a signature by Mayor Bill de Blasio and will take effect 90 days after it becomes law.